Education for Life in Public School : Plants Have Feelings Too. Lately I feel like I am in a time warp. Even though the winter holidays are upon us in present time in my Social Studies class we are in ancient Egypt 3000-2000 BC. We have been studying agriculture as we left Mesopotamia and the Fertile Crescent to visit Egypt and the Nile Valley. Both cultures boasted advances in agriculture in ancient times. Since I’m always looking for ways to have my students experience what they are learning I decided that we needed to spend more time in the garden. One teacher had already planted wheat so that the students could watch the wheat cycle through out the year. After we went out to observe the five inch tall wheat the students said a bit surprised, "It looks like grass!" 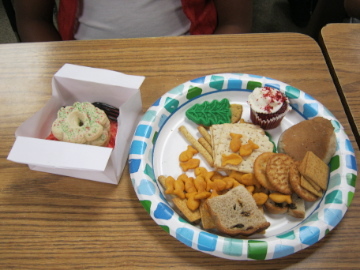 Following this, we had a pot luck where students could only bring foods that were made out of wheat. We ate as we watched a video on wheat production from planting to bread on the table. We waited for the seasonal heavy rains to stop before we went out to the garden to see what else we could find. The students had a focus; they needed to observe plants and take notes. I find that they concentrate and calm down if they have a purpose to focus their energy. Some of the boys still were excited by the dirt, mud, and water, especially since someone in the past months had dug a tantalizing moat complete with water as they were trying to reproduce an example of irrigation. 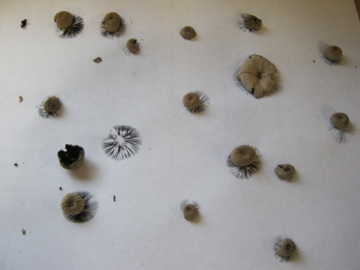 One student was intrigued by the mushrooms growing and wanted to show us how mushroom caps once put on paper and left to dry will unburden themselves of spores leaving a magical dusty ring. I love it when the students are the teachers. We also found many other cool things growing like strawberries, broccoli, cabbage as well as the remains of the summer tomato plants. We also found empty soil beds crying to be used. I chose fava beans for the students to plant because they can be a cover crop feeding nitrogen to the soil or we can let them propagate and have fava beans to eat- hopefully right around the time we study Greece and Rome. 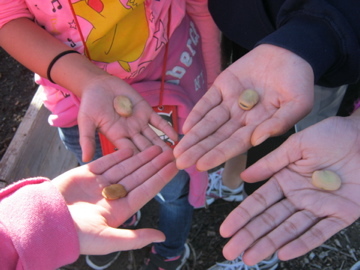 Also, each bean is big and each student can plant one bean and have their own plant. I explained to the students that plants have feelings and that they need to be treated with kindness, respect, and gratitude. This was a new concept to some of them but their hearts naturally responded. I asked them to talk to their bean seed while they were waiting their turn to plant it. To encourage their little baby to grow. It was so enjoyable to see what they did with this suggestion. One student named her bean “Stewart” so then many others named their beans. One boy planted his bean, stayed to talk to it some more, and ended up 'teaching' his bean math and singing! A group of girls got carried away and decided that their beans would marry and adopt some of the other beans. I tried to get them to wait until their plants were fruit bearing age before they married them off but they did not want to wait. After school apparently they got together to make invitation cards for the wedding and went out at lunch the next day for the ceremony. This is all making us learn, smile, and laugh big time! I’ve also suggested to the students that they bring a present to their plant like a dry leaf, a handful of compost, a worm for its soil. We will be going out and visiting our plants and watching them grow. How wonderful to live in mild California climate and be able to do this in December. Thank you Mother Nature.